Hurricane Florence’s heavy rains and tropical storm-force winds reached North Carolina’s Outer Banks on Thursday morning, leading the way for a storm packing 105-mph winds. Florence has weakened a bit over the past 24 hours, but it has also grown larger and will likely dump torrential rain over North and South Carolina through Monday. Before noon on Thursday, a rush of ocean water had already invaded the streets on the southern end of North Carolina’s Hatteras Island, according to The Virginian-Pilot‘s Jeff Hampton, who said arterial roads were at risk of being impassable after water overwhelmed the dunes. “Little change in strength is expected before the eye of Florence reaches the coast, with weakening expected after the center moves inland,” the National Hurricane Center said. Florence is currently a Category 2 storm. Despite the drop in wind strength, the most dangerous threat comes from Florence’s rains and storm surge, which could bring flooding far inland. Florence was about 110 miles east-southeast of Wilmington, N.C., at 2 p.m. ET Thursday, the National Hurricane Center said. The storm was moving northwest at 10 mph. It’s currently predicted to make landfall near Wilmington and then head west across South Carolina. Hurricane conditions will likely hit the Carolina coast on Thursday night or early Friday. And Florence’s large wind field will add to the perils as the storm grinds over beaches and inland. 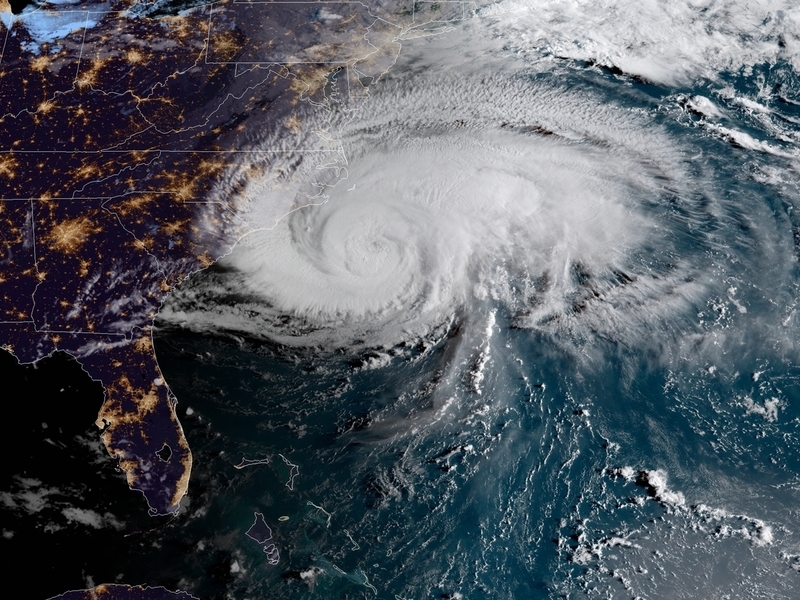 A hurricane warning is in effect for a big chunk of the Carolina coast, from the South Santee River below Myrtle Beach, S.C., to Duck, N.C. — part of the Outer Banks. The warning also includes Albemarle and Pamlico sounds, large bodies of water in North Carolina that could see significant flooding. Despite the drop in maximum sustained winds, forecasters stress that this hurricane is not to be taken lightly. Hundreds of thousands of people have already evacuated. Officials are urging others in its path to follow suit, or prepare for the worst. Eight entire counties and portions of others in North Carolina are under mandatory evacuation orders. South Carolina Governor Henry McMaster said some 421,000 people have evacuated in his state. Virginia has also issued evacuation orders. Forecasters say Florence will likely turn to the west-northwest and slow down its forward motion — a situation that will bring even more rainfall to the area. The storm’s 12-mph forward speed Thursday morning was a marked drop from Wednesday’s 17-mph speeds. The storm surge — often the most perilous risk to life posed by any hurricane — is expected to inundate areas along the coast with saltwater that’s 9 to 13 feet deep, from Cape Fear, N.C., to Cape Lookout, N.C. A surge of at least 4 feet is predicted for a much larger area. The latest rainfall projections warn of 20 to 40 inches of rain from coastal North Carolina into northeastern South Carolina — amounts that could bring “catastrophic flash flooding,” the hurricane center said. The rest of South and North Carolina, including cities from Charlotte to Raleigh, can expect 6 to 12 inches of rain — and up to 2 feet in isolated areas, the NHC warned. That forecast area also includes part of southwest Virginia. The hurricane center says Hurricane Florence will likely carry sustained winds of 110 mph within the next 12 hours. That puts it at the upper range of Category 2 storms, which have winds from 96 to 110 mph.